There are lots of factors that can contribute to the success of a blog post. In fact, there are so many, some can get missed when you are planning, writing and loading your blog into WordPress. To make sure you don’t miss any and to give your audience a better chance of finding your blog, this blog lists the things to do before and as you add a post to WordPress (it could apply to other website creation tools too). To help you get the most from you blog writing efforts, I’ve also created a checklist in a printable form. It’s available to download at the end of this post. Print it and keep a copy handy next time you are writing and publishing a blog. There is more to do once you publish; that’s the important promotion part. You’ll find that in a separate blog and free checklist (coming soon). Decide which client persona your post is for – choose which one of your client personas you are writing for. It makes planning your content much easier and more effective if you can keep it focused on one persona’s challenges and needs. Decide the blog’s purpose – every blog should have a goal. What do you want your persona to do after reading it? What will be your call to action? Is the blog useful to your persona? – always remember your persona and how you blog will help them. Is the blog topic of value, interest, relevance to your audience? What can they take away as useful information or advice? Do your keyword research – research the keyword (or series of keywords) that people are searching for based around your blog topic. You need to find a term that you have a chance of ranking for. HubSpot have a good six step guide on keyword research for beginners. Use a working blog title – come up with a working title to help guide you as you write. It doesn’t have to be the final headline for the published post yet. I decide the final headline at the end of the writing process. Stick to one topic – don’t get distracted and bring other topics into the blog post. Keep to one subject and save other topics for another blog post. Keep your one client persona in mind – remember your persona’s challenges and how your blog post will help to solve them. This will help your writing to be more interesting and relevant, and to flow better. Use an appropriate tone of voice – stick to your brand’s tone of voice and write at your client persona’s level. Only use jargon if your reader would understand it. Have a hook in the first paragraph – make sure you start with a strong hook to make readers want to carry on reading. Get to the point quickly or your readers might get bored and move on. Showing you understand exactly what your persona is going through or telling a powerful story are techniques you could use. Use your keyword in the first paragraph – this is one of the many factors that helps with search engine optimisation (SEO). Blog length – there is no right or wrong answer on blog length. Yoast recommends that posts are a minimum of 300 words to help search engines find them. But some very effective blogs can be mammoth! CoSchedule have collated the results of several surveys on blog length. I’d suggest you write at an appropriate length for your topic and your readers. Track your blog results with your website analytics and numbers of comments to find out which blog posts at what length work best for you. Don’t overstuff keywords – blogs overfilled with keywords are hard to read and they also get penalised by Google. Try to use synonyms where you can, and most importantly, write naturally. 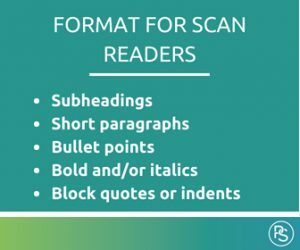 Use sections and subheadings – break up your content into smaller sections by using subheadings. Using keywords in your subheadings helps with SEO too. Use indent or block quotes to highlight important sentences. Add internal links to your other blog posts or pages – adding links to other blogs on your own website helps your clients find more useful information, keeps them on your website longer, lowers your bounce rate and helps with SEO. Use meaningful words as the link (anchor text) rather than ‘here it is’ wording. Add authoritative external links – add at least one external link to an authoritative website. This helps search engines understand your niche and helps your audience learn more about your topic. Bonus tip: external links could expire. Keep a single spreadsheet of the external links you use in your blogs and listing the blogs they are in. Regularly check if the links are working using the sheet. It’s quicker than having to find them in your blogs. Wrap up with a conclusion – a strong ending can leave a lasting impression on your readers, make them come back for more or take the action that you want them to. Summarize your post, remind readers the benefit of taking the advice that you give or challenge or empower them to take the next steps are examples of good conclusions. Encourage comments – ask a question or encourage comments at the end of your blog posts. This helps you to find out what you audience like, are unclear of, or what other information they might enjoy. It also acts as good social proof and encourages others to like, comment or share your posts. Finish with a call to action – remember the original purpose for your post? Make it obvious to your readers what you want them to do next. For example, post a comment, click on the download, subscribe to your blog or book a discovery call. Choose a final headline – you may have been writing with a working title but now is the time to create a killer headline. Make sure your headline is descriptive and persuasive to make people click to read more. Include your keyword too and aim for 70 characters or 15 words maximum. There is lots of advice online on what makes a good blog headline. You could try a headline analyser like CoSchedule’s to craft one. Check readability scores – readability scores tell you how easy your content is to read. Prowriting Aid and Hemingway App give your content reading ease scores (Yoast will do this for once the text is in WordPress too). Make improvements to sentence length and structure where you can. But remember to write for your audience – a technical audience will understand a more technical article and simplifying it too much could be patronising. Check facts and figures – check all the facts figures you quote are correct from one or two reliable sources. Check spelling and grammar – proof read your post. Ask others to read it and follow simple actions to avoid publishing posts with mistakes. I prefer to write everything in a Microsoft Word document first. Once I’ve finished, I look at headlines, subheadings, keywords, synonyms and formatting before I copy and paste the text into WordPress. Bonus tip: copy and paste your text from Word into Microsoft Notepad before pasting it into WordPress as this clears any hidden formatting which can sometimes be troublesome. I recommend installing Yoast for SEO into your WordPress blog. Yoast will highlight many of the points below. Add on-brand and relevant images. Choose relevant professional images or graphics in your brand style. Check image licenses – make sure you have the correct license to use the image. Edit, crop or resize images – I find it easier to do this to images before bringing it into WordPress. My favourite tool is Canva. Optimise file sizes for web use – as large files can slow your website down. 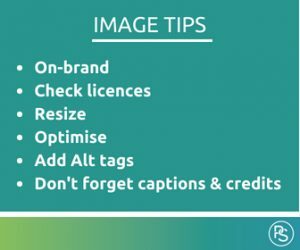 Add ‘Alt tags’ to your images. Adding a description of the image including your keyword can help with search engines. You can do this in WordPress in the individual image. Add a caption if it helps put your image into context. Add a credit with the image if the image license requires it. Use H1 for your blog heading – when formatting your blog in WordPress use H1 for the title of the blog post (this is the default in WordPress) and include your keyword. H1s effect SEO as they tell search engines and website visitors what the pages are about. Only use H1 once per blog post. Use H2 and H3 as your subheads – you’ll have put your content into easy-to read sections with subheadings. Put the subheadings into H2 or H3 heading formats in order, as these are useful for SEO too. Set the slug – WordPress will default to using your post title as your page title and URL. If the title is long, shorten the slug and remember to include your keyword. Edit your meta description. This is the snippet of text that appears under the post title on a search engine. WordPress will default to the first few lines of your blog unless you change it. You should summarize your post and include your keyword. In the 150 characters words you have, make the post sound enticing so readers click through. Add an excerpt – This is the short piece of text that appears under a blog post on your main blog listing page. As with your meta description, the default will be the first lines in your post but remember to edit the excerpt to make it punchy and clickable. Check readability scores in Yoast – you’ll have done a readability score check before loading the content into WordPress but the built-in readability checker in Yoast is a useful second check. Aim for a green Yoast traffic light – a green light for SEO on Yoast is ideal. Yoast’s improvement suggestions are easy to follow and include most of the topics covered in this post. But don’t get too hung up on getting a glowing green light. It’s good quality, clear content that’s not overstuffed with keywords that is important. Add internal links – you’ve selected these already in you writing, now create the links in WordPress and remember to use your keywords in the anchor text. Set external links – you’ve highlighted these already in your writing, but make sure these links are set to open in a new tab, so that readers can easily return to your website if they want to. Format your call to action – make sure your call to action stands out. Put this in a box, bold text or another brand colour to make sure it’s noticed. Add categories – you can categorise blogs in WordPress and it’s best to have a clear category strategy before you start your blog and not chose too many. I currently have five categories (planning writing, sharing, my insights and my ‘What… can teach you series). Categories help readers browse more topics and help with SEO. Think of categories as the chapters of a book. It’s best practice to use title case for naming categories. 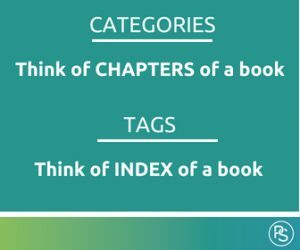 Add tags – if categories are the chapters in the book, tags are your index. You can use tags to describe some words or topics mentioned in the post. It’s good practice to use lower case when naming tags. Use correct author attribution – if there are a few people who contribute to blog posts in your business, make sure you attribute the correct author before you publish. As with most things in this list, you can change this later but it is easier to get it right first time. Preview your blog post– before you publish your blog, preview it in WordPress. You can check that any formatting, layouts, images and buttons are looking and working correctly. Check internal and external links – while you preview your blog post, check that any internal and external links go to the right pages. Publish it – hit that publish button or set the date to publish the blog at a time that works best for you and your audience. Check it works and looks OK – check the published post on a few different browsers on a desktop, on a mobile and on a tablet to make sure any formatting works. Link to your new blog post in older posts – are there any old blog posts where a link to your new post would be appropriate? If so, go back into your older blog and update it with a link to your new post. This helps your reader and helps SEO authority. Promote, promote and promote – it’s time to promote your blog post. A Blog Post Promotion Checklist will be coming soon! I’ve created a printable ‘40+ Things You Must Do Before You Publish Blog Post Checklist’. 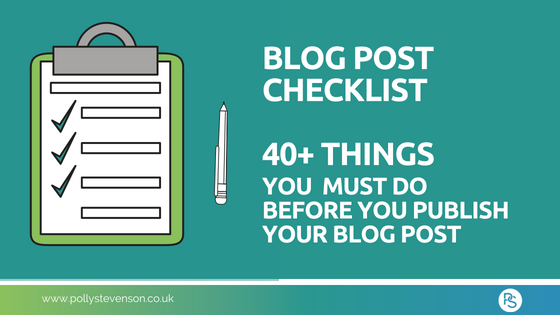 You can download it, print it and pin it by your desk to check off the actions to follow to help you plan, write and publish an effective blog (or even use it to check your existing blogs are set up correctly). To help you plan, write and publish your own effective blogs, I've created a printable 40+ point checklist. Please also tick below if you would like to receive my quarterly newsletter. Thank you for requesting my Blogging Checklist. Please check your email!